@fuzzmanmatt gets notstalgic Anybody remember the old power stations that would live under the monitor of your Packard Bell in the 90s? @kazriko has a very similar power strip and shares the downside once you put 6 wall warts in the 6 outside slots, the middle plugs are blocked and inaccessible. No protection for a phone line? Pass! @narfcake Exactly. I wouldn’t want my precious RJ25 cables to get fried. @narfcake You can plug an RJ11 plug into an RJ45 and the pairing will be correct, therefore the protection will also be correct. On an RJ11 the pairs are 1 and 4, 2 and 3. Plugged into an RJ45 socket those connect to pairs 3 and 6, 4 and 5. So that works correctly for one and two line jacks. If you have 3 phone lines using RJ12 connectors, then you are severely twisted and nothing will save you. The lightning will hunt you down and destroy your equipment solely to restore cabling purity. Yes! I just learned about that recently. That’s how we connected our multifunction copier to the cable modem — so we can continue sending faxes through a wormhole to the 1990s. The guy wiring up our new office forgot about the phone jack we asked for, but we had an excess RJ45 jack. Done! So many sockets, not enough pop. I wonder if someone somewhere has a configuration of electronics that can make max use of this, with no wall warts or other plugs that would cover more than one socket. @shahnm Perhaps a home office - computer, monitor, printer, hub, speakers, phone, shredder, lamp, etc. @narfcake @shahnm That’s why you buy these 1-ft extension cords. @shahnm I can fill one easily. It might not have a wall wart in all 6 though. But I do love me those short extension cords…! @mike808 @narfcake Oh please. Real men use POWER SQUIDS!! @mike808 @narfcake @yakkoTDI I still have several powersquids from woot. I love these things. @narfcake @yakkoTDI Too bulky to keep in the laptop bag. I have some of these piggyback cables. Makes it easier to share an outlet in device-hostile locations like some airports & coffee shops. @Bandrik @mike808 @narfcake @yakkoTDI I think meh sold power squids too way back when as I have one. Power squids rock! Bought 6 of these in a Woot Off years ago for like 3 bucks a piece or something dirt cheap. Still using 2, gave some away as gifts, got one left. Saving for when I get old to power my oxygen, Life Alert, charge my scooter etc. Makes it easier to share an outlet in device-hostile locations like some airports & coffee shops. Even at a small bag space trade off, I prefer to put a surge protector between my devices and “foreign” power sources… actually, I never plug my electronic devices into wall current anywhere without a surge protector. These Belkins are not made as solidly as when they launched 10 years ago, but still handy. And the plug rotates. Takes some real creativity to hide them all, since the desk is just frosted glass on top of an open steel frame. Also, I have lights installed underneath the glass — no dark corners anywhere. So I have 15 devices - about half with wall warts and half with standard plugs - that I have plugged into two ordinary multi-outlet strips, one multi-outlet UPS, and a single wall outlet plug occupied by the powerline adapter (four wall plugs total in two wall outlet boxes). Fortunately I don’t pull a lot of power, but it does take up a lot of space. What happens if you plug a phone into the tablet USB port? Does it catch fire? @EvilSmoo it turns into a tablet. This surge strip protects everything. Well, it is missing Wi-Fi. Start a keto diet, then you can throw away the toaster. No need to choose OR buy a surge protector. You are welcome. @tinamarie1974 Until you discover all the recipes for keto bread which tastes infinitely better when it’s toasted and slathered with butter. @LaVikinga You are right! i actually don’t own a toaster. I just turn on the oven and toast my bread old school. It works and saves me an appliance on the counter. I don’t need another one of these, but if I did, I’d buy this one. Sorry I already have lots of these, Meh. @wishlish Depending on how expensive the equipment plugged into them are, it might be worth checking how old your surge protectors are, the actual surge protection capabilities wear down over the years, even faster if they have to handle surges with any regularity. @candreasen The four protectors in my office are all under three years old, and two are only a year old. I do monitor their age. Good tip! @candreasen @wishlish Great tip! Just took stock and realized my surge protector is about 15 years old. May be time to swap it out. this thing’ll power 12 Ninja blenders? @alacrity - Looking forward to the video! Right-angle plug, or straight in? @mr_crash_davis I believe this eBay listing is the same product, and the photo shows a fixed right-angle plug. The right-angle plug is one of those nice little joys in life when you wish to place furniture close to the wall. The flat right-angle plug adds sugar to that little joy. @mr_crash_davis @RedOak Unless you want to place the furniture against the opposite wall, in which case you’d reach for a left-angle plug. @mr_crash_davis It’s not the good kind of right angle though. The cord goes straight down so it only works in the bottom outlet without blocking something. The flat plugs that have the cord coming out 45 degrees to one side or the other let you use both sockets. @rpstrong Tripp Lite actually sells USB Micro cables with right, left, up and down angle plugs. I have a very similar power strip, and unfortunately, once you put 6 wall warts in the 6 outside slots, the middle plugs are blocked and inaccessible. Somewhat disappointing really. Maybe it’s not the broccoli that’s stinking up your bathroom – just sayin’. @givemehdeal Normal “code” circuits only allow 1500W total draw as safe for a 15A circuit. 1500W = 12.5A @ 120V. The cushion is for surges and safety. So they are assuming a 100W per item average, which is reasonable if you’re plugging in a bunch of 1A or less power bricks. 6 hair dryers, 4 space heaters, and two microwaves would be a no-go. @givemehdeal @mike808 Non-flammable? Challenge accepted! …and a jumpstarter in a pear tree. Anybody remember the old power stations that would live under the monitor of your Packard Bell in the 90s? With like, six lighted switches on it that you had to hit in the right order or Windows 95 wouldn’t boot properly? I need one of those. @fuzzmanmatt The 6-outlet Tripplite TM-6PLUS is what you’re looking for. About $100 on Amazon. @fuzzmanmatt - Do I remember? How about still use. For the Win 95 PC’s that control legacy equipment. I am slowly converting the hd’s to ssd’s. Some of these systems have been running since '95. With original hd. 24/7. Go figure. @mike808 I saw that when I was looking for a picture of what I was thinking of. I’m sure I’ll run across something at a garage sale if really get nostalgic. @fuzzmanmatt I thought you were wanting the functionality, in currently available equivalent form. I agree, the only place you’ll gind those OG devices, as you’ve noted, is at a garage sale, office equipment auction, or maybe a local electronics recycling event (assuming you can buy it from someone dropping one off). @fuzzmanmatt I have one in my garage, I think it has a swivel on the top as well as the switches on the front. I have no use for it, and rather than recycle it at my local EcoPark, I will let you have it if you will provide payment for shipping. PM me if interested. @fuzzmanmatt I’m still using mine. The neon lights in the switches flicker so I was considering replacing those switches with LED ones. I’d have to disconnect all the wires and lift that huge monitor so I haven’t been too motivated to finish that project. @fuzzmanmatt The thing that I miss is when Desktop PCs had power output in the chassis that would power the monitor. Only one outlet needed for both devices - monitor plugs into the PC, PC plugs into the wall (or Monster Surge Protector). @fuzzmanmatt The one on the Apple ][ in our elementary school library had the big paddle-style switches like on old IBM PCs… you know, the ones that could take a second or two power outage without rebooting. BIG caps in those AT power supplies. This looks like something you could play hopscotch on(if the scale was correct). I’ve used a lot of these Belkins at work, no smoke or flames yet. No USB charging, but I don’t really need that. The wall wart outlets are well spaced from the center row, no problem with blocking them. @blaineg on that belkin. Have one too. The spacing is OK, but you might have problems with the “slim” bricks that are popular taking up two or more spots in the middle because the plugs are rotated from the edge, and you dont want to waste a wide spot on the edge for a slim brick. @blaineg I own several of these from NewEgg, within a buck of the same price. The only issue I have with these is that the little plastic insert that is inlaid around the two straight prong slots pop out over time/use. Not a safety or functional issue, just aesthetics. Otherwise they are great. @mike808 True, but you can put a slim brick in each of the top and bottom of the center row. Or see the one below, it’s great for the slim bricks. @Jonas4321 Yea, I’ve had a few of those sliding covers vanish. But if you have something plugged in, you’ll never know it’s gone. Except for way down deep inside. @blaineg second this. It’s what I bought after my monster power surge protector bought from another meh deal started emitting a high pitch noise after a few months of use. No problems with the Belkin for the past 3 years. @blaineg @pyro008 The surge protection does wear out with each surge it absorbs. Probably time to replace. But if you need more flexibility, the side outlets on this one rotate 90 degrees. $27 on Amazon right now, but I got mine for $22. 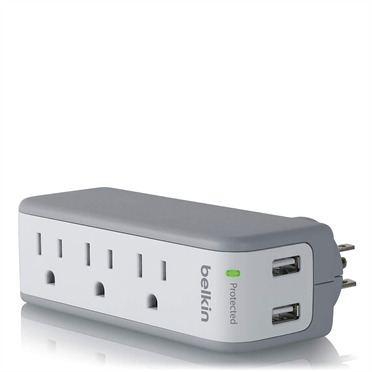 @blaineg They might not rotate the “right way” if your power bricks have polarized plugs. They’ll work, but it just won’t be as pretty/neat if youre OCD about what it looks like behind your TV stand. @mike808 I’m totally unqualified to address OCD. I’m a weird mix of OCD and “eh, who cares?” myself. @blaineg I have two of those. They’re great. Thanks for reminding me why the hell would I buy this meh monster deal when I could get that for a few bucks more that I already know and love. I guess no USB port? @goldnectar Nope, no USB charging. I only bought one and I wish I had bought 3. @ciabelle @mediocrebot Is that a woman, or Rod Stewart? Grrr. No one’s fault but I very much wish I had bought one of these rather than the pair from last week that only had 8 ports. @grovberg @deathbynoodlez Oh, I’m sure it’s someone’s fault! What could you possibly use the Ethernet plug for? Isn’t typical Ethernet from modem/router to device? Why would u need to plug that into an outlet? @Jenerous73 that line can also carry a surge, especially if your modem is in one room, and this setup is in another. If your surge protection on the router (remember that post upstream about how old your surge protector is…?) failed to clip the load then it could travel along the Ethernet line. @chienfou @Jenerous73 just remember to put a surge suppressor in every Ethernet cable. We had a lightning strike long ago that managed to temporarily mess up every picture tube in the house and it induced a destructive current into the one meter long Ethernet between my DSL modem and the Linux PC acting as firewall. It destroyed the ethernet on both the router and the PC. At the time, I had ethernet and phone lines running throughout the house. Almost all of those cables were much longer. My wife was looking out the kitchen window when the lightning hit. She said everything just turned white. Then it took a while before she could see anything at all. This suggests that the lightning strike was on the other side of the house. If it had been in her field of view, she would have had a lightning bolt shaped blind spot for a while. I am guessing it hit the neighbor’s metal fence. @Jenerous73 For those few of us who use powerline adapters to get a wired ethernet connection between devices in different rooms, the surge protection for ethernet would be very handy. My modem/router is in my living room, but my network printer is in my office where I have neither a wired ethernet connection nor good wifi signal. Therefore, if I want my printer connected to my router as it needs to be, the powerline adapter uses my home’s electrical lines to transmit the ethernet connection between the two - which unfortunately makes both devices doubly subject to voltage surges. So is that last picture from the Brady Bunch Hawaii special? @oldmantick - the Brady Bunch Garden of Bomarzo special. I’m just extremely disappointed you didn’t call it a dilemmeh. My Monster Power Strip came with an added bonus! The box was coated in a lemony smelling oily substance, which coated the entire inside of the packing bag. Smelled good!